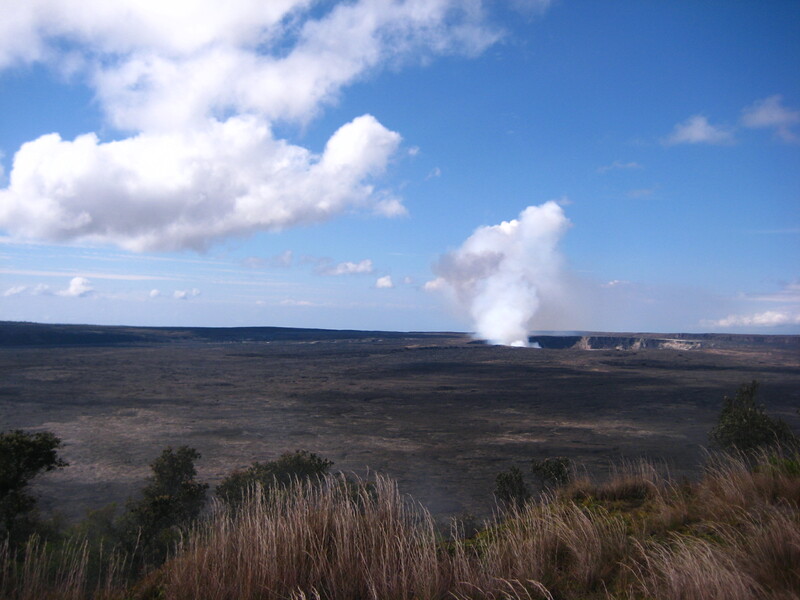 The Big Island is still in the active volcano stage with three of its five volcanoes going strong. You drive around and get to know places by what used to be there. 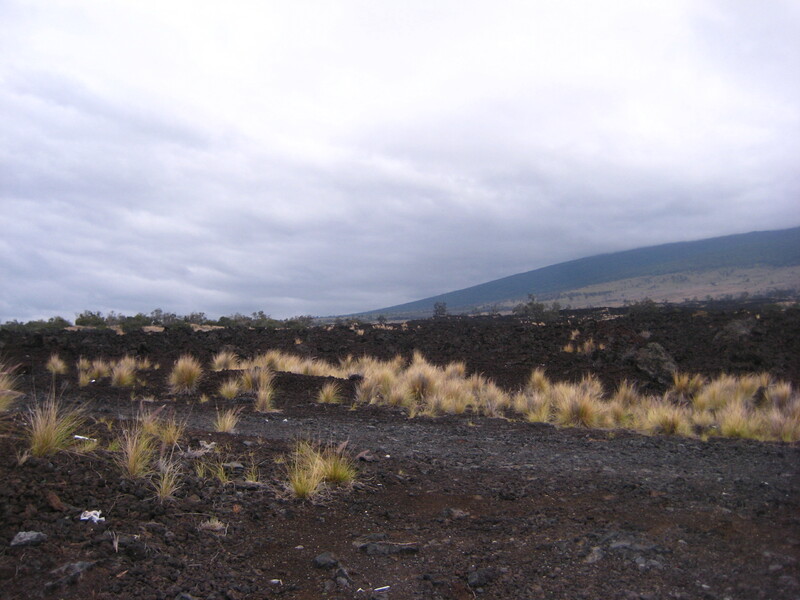 “Oh, here was Kapoho town,” they say, and all you see is the gray black of the 1960 lava that took out the railroad, the general store, the homes, the cemeteries, everything. 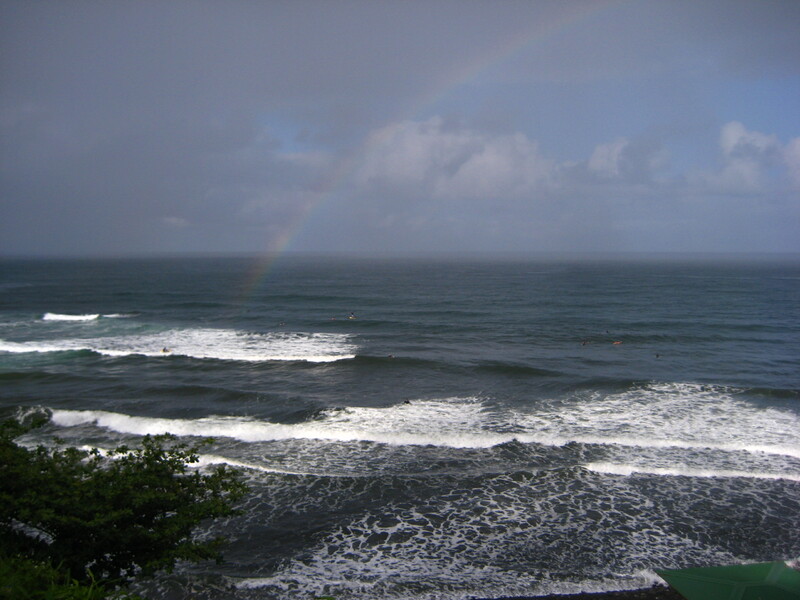 “Oh, here was the Royal Gardens, the famous black sand beach of Kaimu with its shady coconut palms.” Now, where there was ocean meeting sand, there is dried a’a (Hawaiian for “stony rough lava;” pronounced “ah ah,” like the sound you would make if you had to walk barefoot on it) extending for a mile to the sea. It’s in this spot that you find Uncle Robert’s. 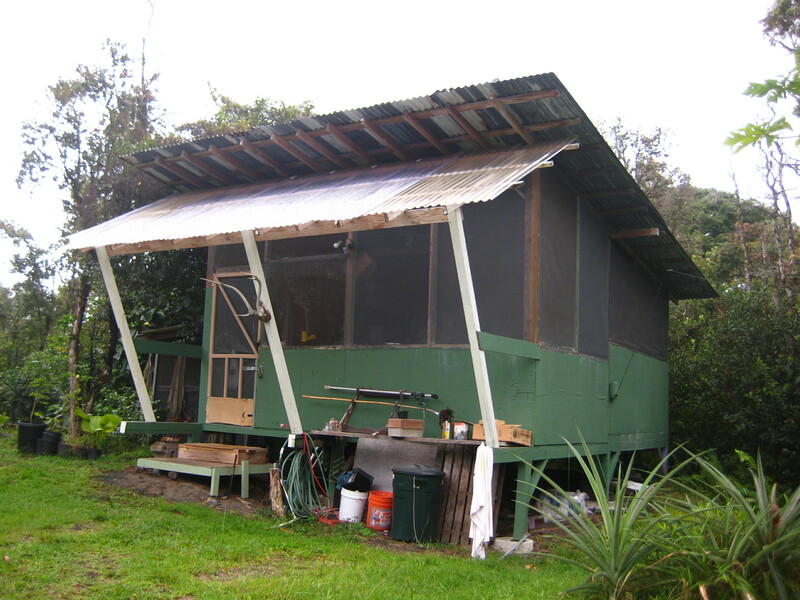 His home was spared by the lava and literally turned into, as the locals call it, “The End of the Road.” He’s an old Hawaiian Catholic man with hands that make a half-gallon sake bottle look like a salt shaker as he holds it. The land has been in his family for generations, and the generations still all live there. Uncles, aunties, keiki and their patriarch. 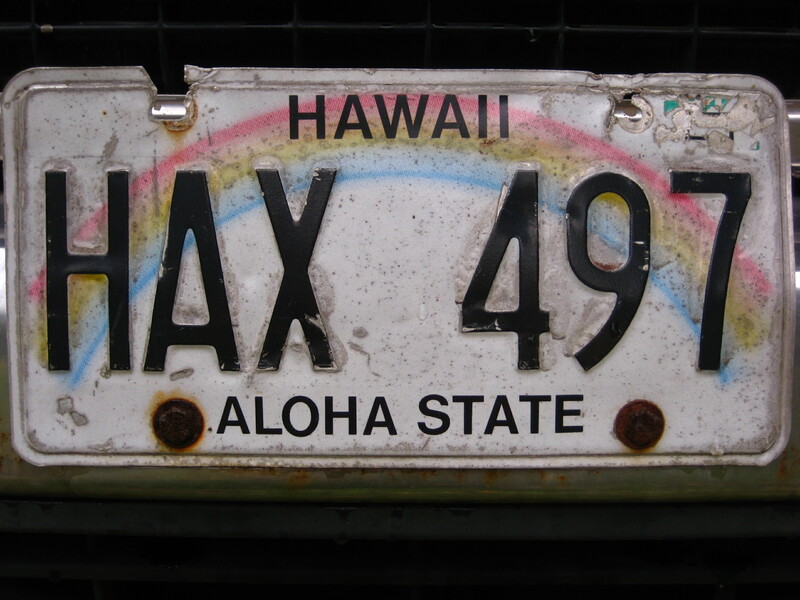 And in true aloha spirit, they’ve opened their home up to all. 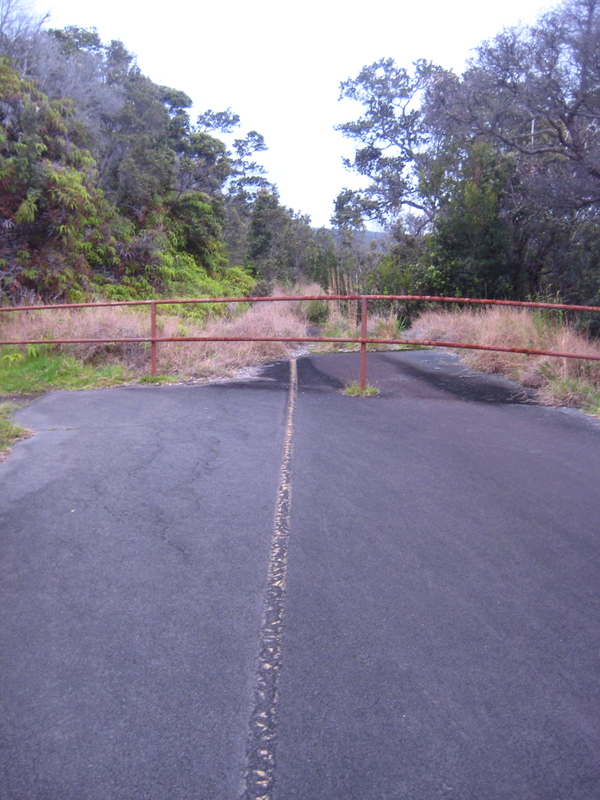 On Wednesday nights, you can take the road that snakes down the coast from Kapoho to Kalapana. You park at the end of a line of cars pulled over on the shoulder and walk up in the darkness. As you get closer, you start to feel the warmth. The heady smell of plumeria. The lulling, happy rhythm of the ‘ukelele plucking out a Jawaiian number. The white dog curled up at the singer’s feet. The wooden benches in rows around the dance floor. 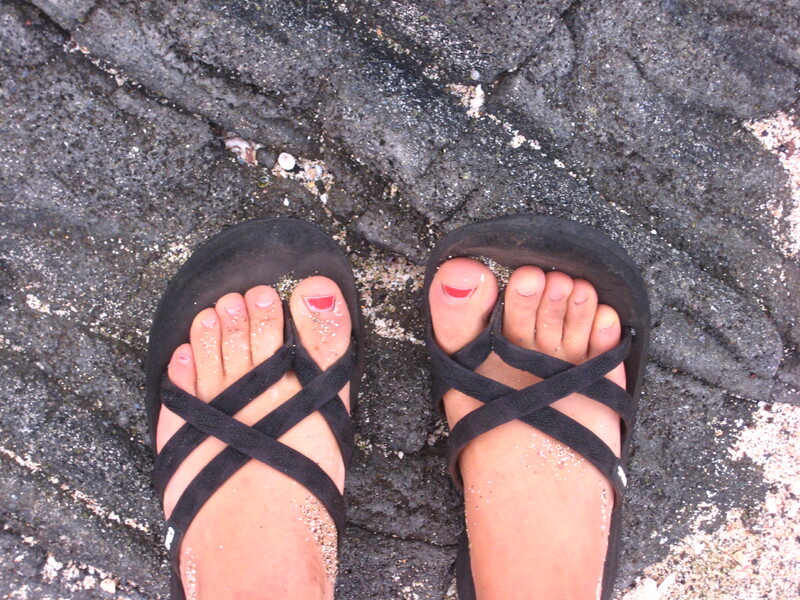 The sound of the hippie woman’s sandals against the concrete, the grains of sand grinding in a swoosh as she turns. I went to Uncle Robert’s in the day time, too. It was different without the crowd, more of a home. A teenage nephew practicing the drums on the stage. The keiki trying to catch their Easter rabbit under a truck. A granddaughter off to hunt a pig with the boys, bouncing a rifle in her hands down the path. The sister greeting me with a gentle, beautiful, toothy smile. Later, as we wander back to our car, someone has put Allison Krauss on the stereo and I can hear her Union Station boys singing about a faraway land as we turn up the road. There’s a lesson with this place. There’s a lesson with the island. It has to do with destruction and rebirth, loss and growth, change and adaptation. Time wears all things thin. It’s what has shaped the earth over billions of years. It’s how we measure our own transformations from birth to death. And it’s also a force we can sometimes easily forget. This does not seem so on the Big Island. There, I felt acutely aware of time’s hand. And with this awareness, I think, comes an acceptance of the changes it brings, even in the face of real loss. A coconut-lined beach destroyed, a magical end-of-the-road created. 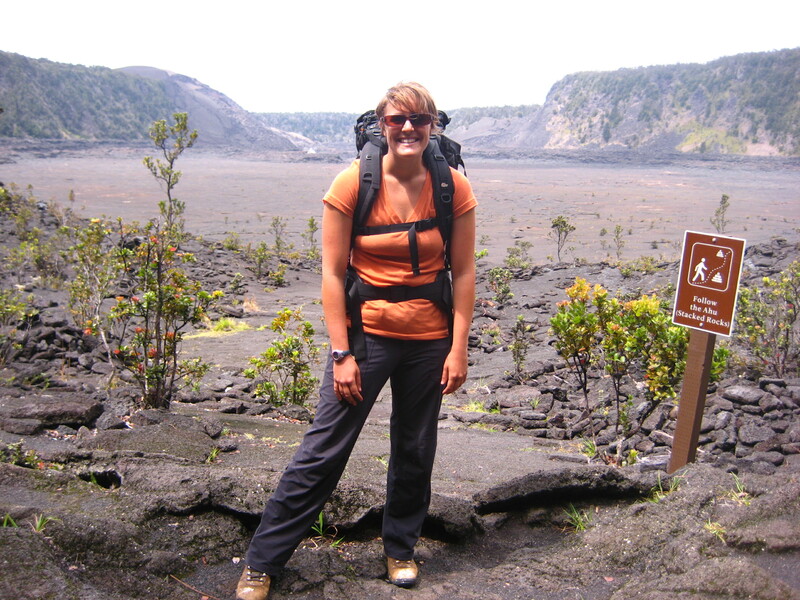 You can step on lava, newly cooled, and know that nothing exists but you and that lava. The town beneath you is gone. You are at the beginning of the earth. 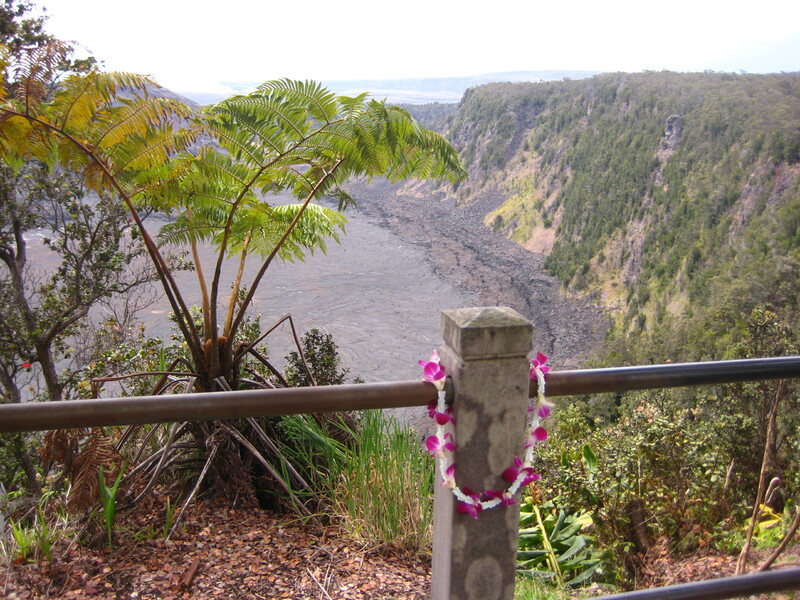 I felt this humility no where more keenly than the night I camped at Namakani Paio, a mile away from the overlook into Kilauea crater. I arrived in the afternoon and pitched my tent ready for a nap after a windy, sleepless night of camping on the island’s southern tip. (I was, needless to say, less than thrilled to hear that my new campsite’s name meant “clashing winds.”) I woke up to children’s laughing and discovered my tent had become the safety base in a huge game of tag. I lay there till dark listening to the kids’ funny negotiations with each other. When things turned quiet, I came out and was walking over to the parking lot when I noticed the sky behind me. It was glowing red. A mist was weaving its way through the eucalyptus trees, dulling the color with its gray, but there was still an unmistakable brightness to it all. 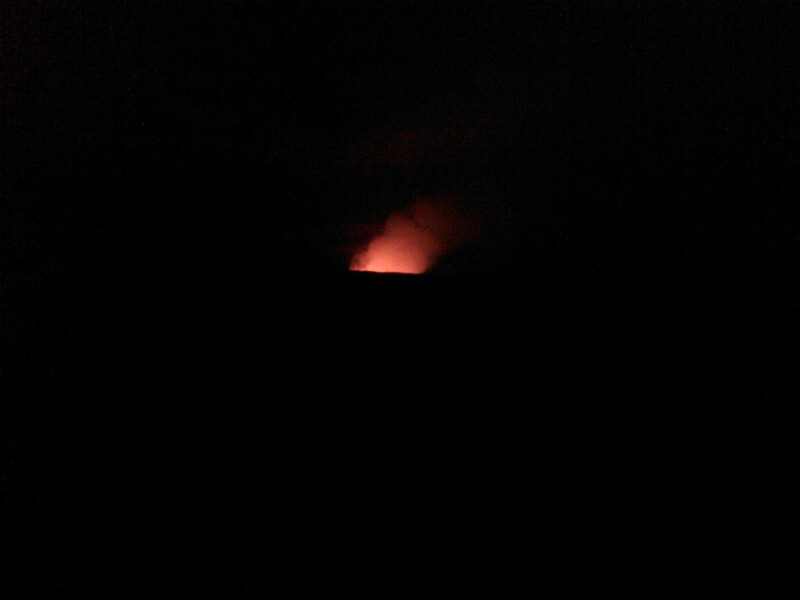 I was in volcano country. 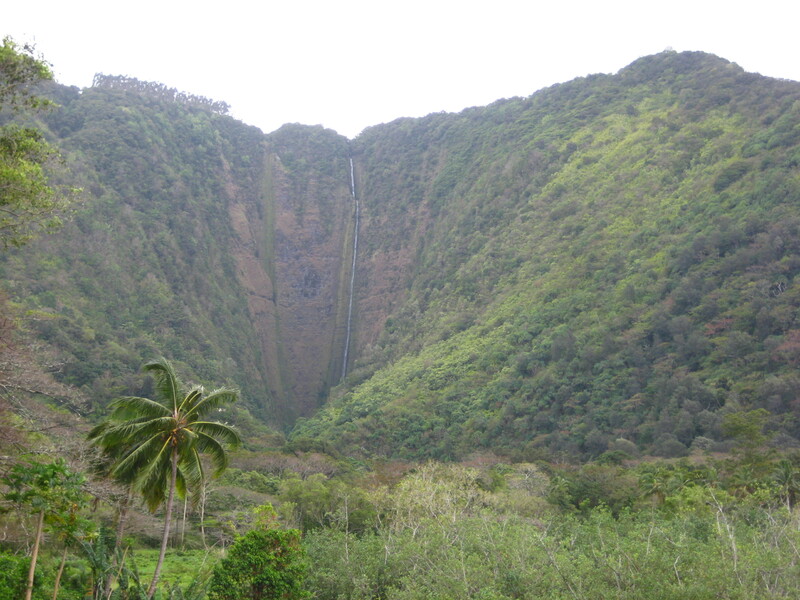 I pass through a rainforest on the edge of the crater and see the kids from the night before on their field trip. 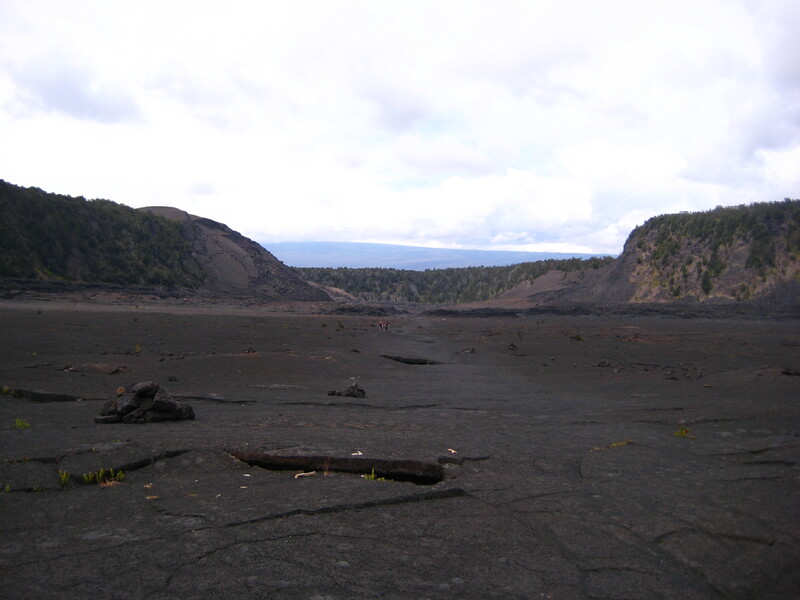 I get to the Kilaeau crater floor and have it all to myself. 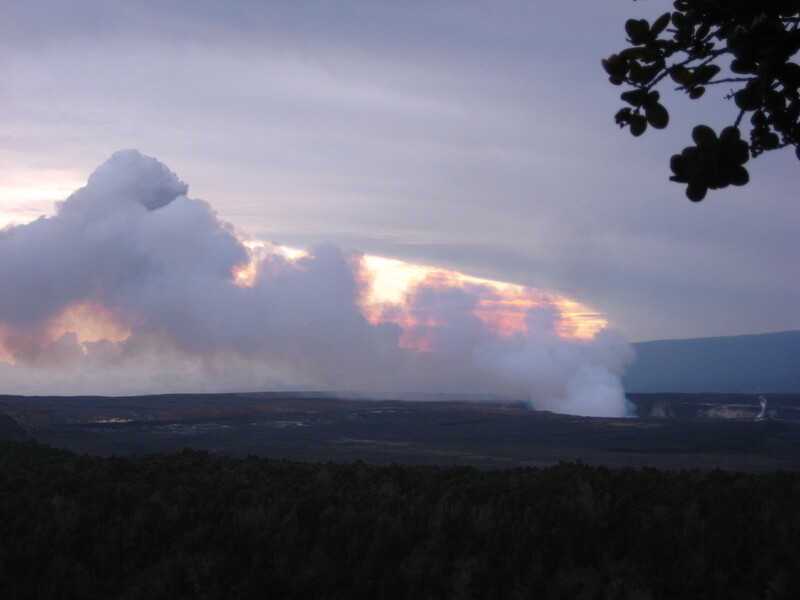 I sit, I draw, I watch the plume of smoke from Halema’uma’u rising in the distance. 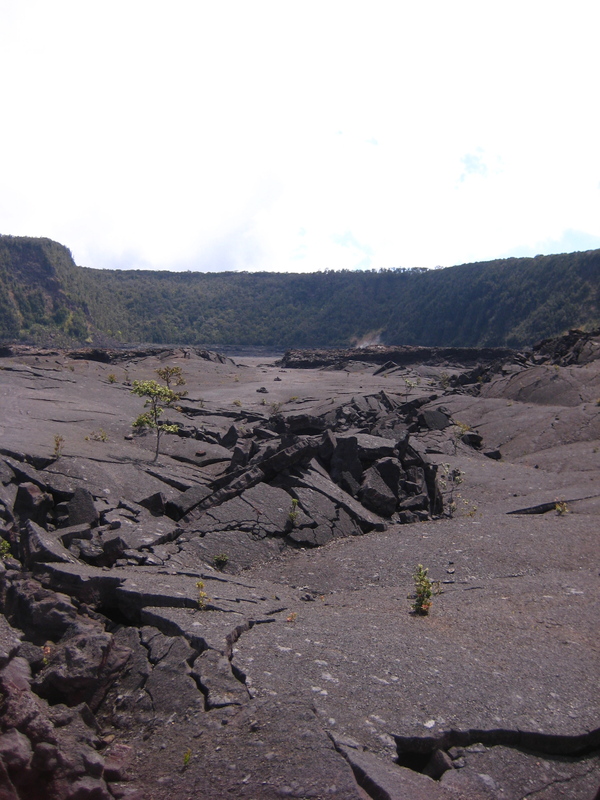 I head up and over and walk the length of Kilaeau Iki, the littler crater. There’s a famous photograph of the Iki’s 1959 eruption with all the 50s-style cars parked at the top watching the great plume of fire and ash. It’s up there, later with a new friend, that I find the old park road. 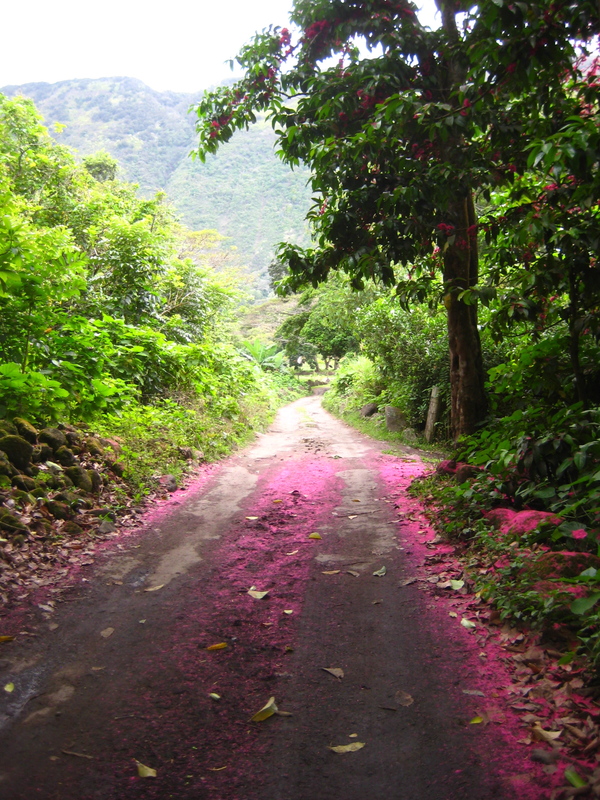 The pavement is crumbled, overgrown, but the speed limits are still up. I feel the ghosts of forgotten tourists all around me, cruising along the faded lines. 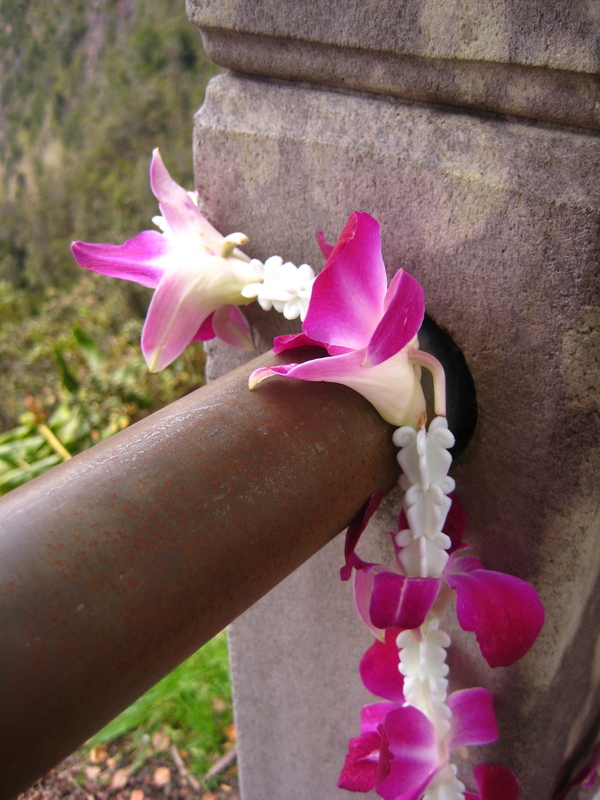 It’s up there along the edges of the craters that I see the plumeria and orchid leis draped over posts. I see offerings, wrapped in ti leaves, placed carefully alongside steam vents. 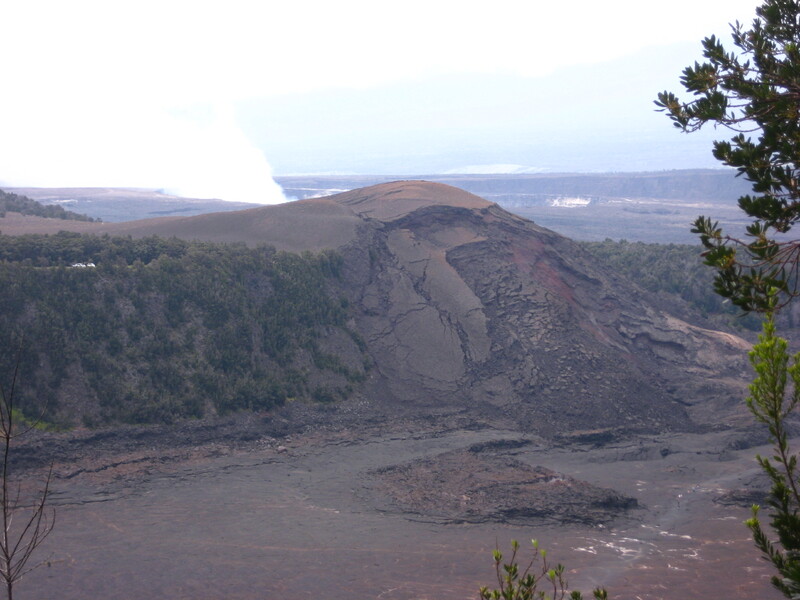 They are reminders of the continuing spiritual significance of this place, Pele’s island. In Hawaiian mythology, she is the deity of all things fire and lightning, wind and volcano. She gives and takes away life. 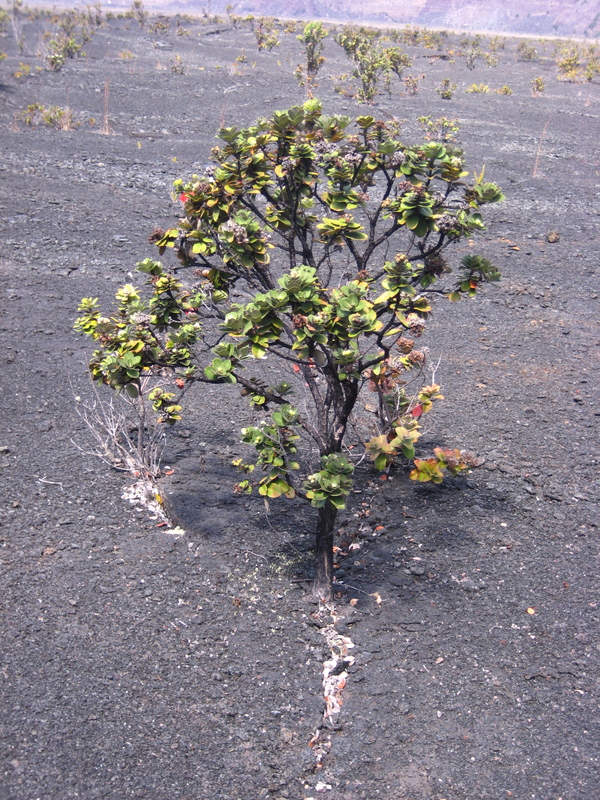 To me, Pele’s island is a small microcosm of life, in all its beauty and struggle. It is simultaneously abundant and barren. It is gentle and harsh. It is raw. It is welcoming. It is unforgiving. It is forever the morning of creation and the mournful cry of life taken. And it teaches me to not fight time and change but to accept the lava’s flow; to accept what is gone and what is born in its place. 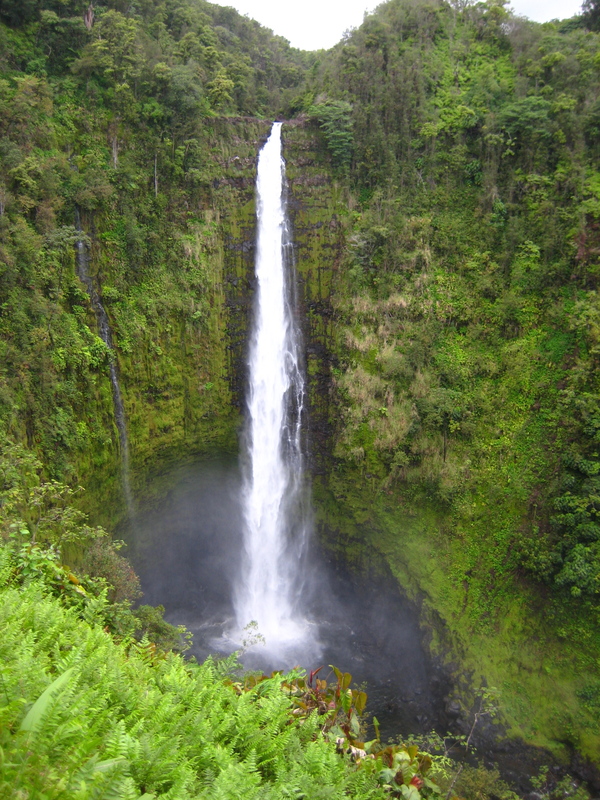 This entry was posted in America, Community, Hawaii, Life Philosophy, Nature. Bookmark the permalink.